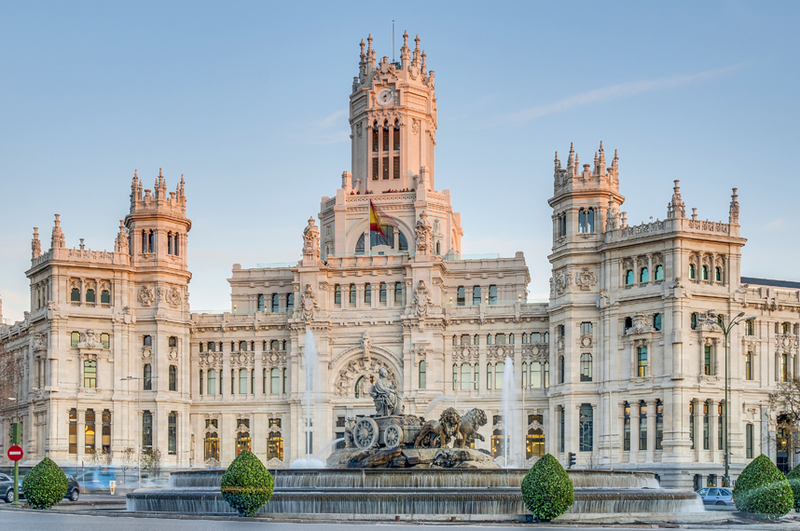 Madrid is not only one of Spain’s most historic cities, but it also has a well-deserved reputation as a thriving centre for modern Spanish architecture. Its blend of classical and contemporary buildings is what lends the city its unique character and vibrant atmosphere. The hermitage was built in 1792 and from the outside it has a somewhat sparse and sombre appearance, built in the Baroque style and decorated with two Doric pilasters. Its interior is spectacular, its dome decorated by the celebrated painter Francisco de Goya, who created frescos depicting the trance of Saint Anthony, as witnessed by the people of Lisbon. The chapel became the resting place of Goya, and was declared a National Monument in 1905. The grand Cybele Palace, situated on the Plaza Cibeles, is an innovative building, an extravagant confection of turrets and parapets, built using a steel frame technology, which permitted the architects to create open spaces inside which rise from the ground, right up to the ceiling of the top floor. Its impressive architecture is made up of a wide range of styles, from Neo-Gothic to Renaissance, Baroque to modern. From the first step inside the building, the visitor is wowed by the imposing marble staircases, the opulent statues, representing figures from mythology, and the brightly coloured stained glass ceilings. It is perhaps incongruous to think that this building once housed Madrid’s main post office, and telephone company. This beautiful, innovative building was designed by Cristina Díaz and Efrén Garcia and was the winner of the 2015 COAM Awards. Historic buildings are set around the outside of the plot, flanked by services and communications infrastructure. This leaves the central space free as a meeting space and area to circulate. The entire structure is cocooned in a shimmering. silver-grey latticework of thin, galvanized steel wands. The Caixa Forum was once an industrial power plant, but has now been transformed into a vibrant cultural centre. Its imposing exterior blends industrial brick walls with rusted iron in a building which appears to be suspended above the ground. 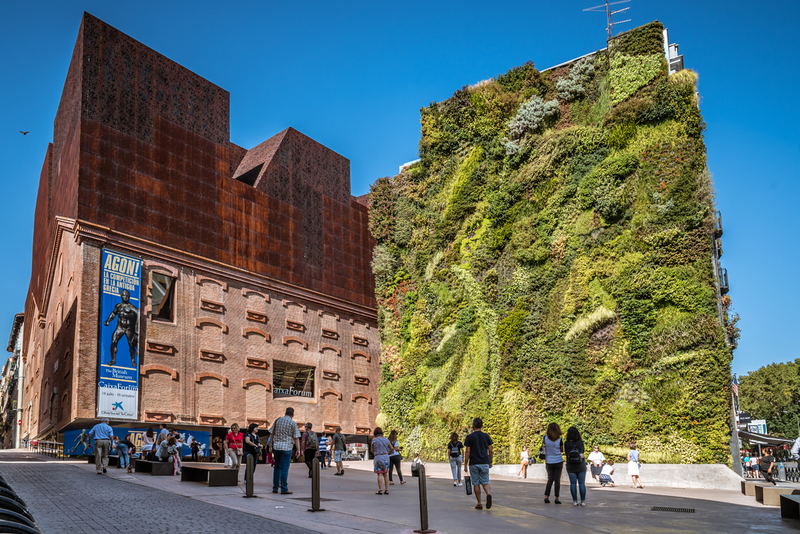 To one side is a stunning 24 metre high vertical garden, inspired by the botanist Patrick Blanc, its lush greens providing a stark contrast to the terracotta hues of the industrial materials.